What Is Veerabhadrasana I And What Are Its Benefits? Veerabhadrasana or Virabhadrasana is one of the most popular yoga postures which adds beauty and courage to one’s yoga practice. No doubt this pose is helpful in many ways. If you want to practice this pose to get the entire benefits of this yoga pose. Keep practicing. This asana or the yoga pose is pronounced as Vee- Ra- Bha- Dra-aasana. It means, Veera – vigorous, warrior, courageous; Bhadra – good, auspicious; Asana – Posture. See if your heel of the right foot aligned to the center of the left foot or not. Now lift both of your arms sideways to shoulder height with your palms facing upwards. Now see are your arms parallel to the ground? just see that. Bend your right knee and Breathing out. Now see if your right knee and right ankle forming a straight line or not. Just ensure that your knee does not overshoot the ankle, because this is important. Turn your head and look to your right. Now as you settle down in the yoga posture stretch your arms further. Always make a gentle effort to push your pelvis down. 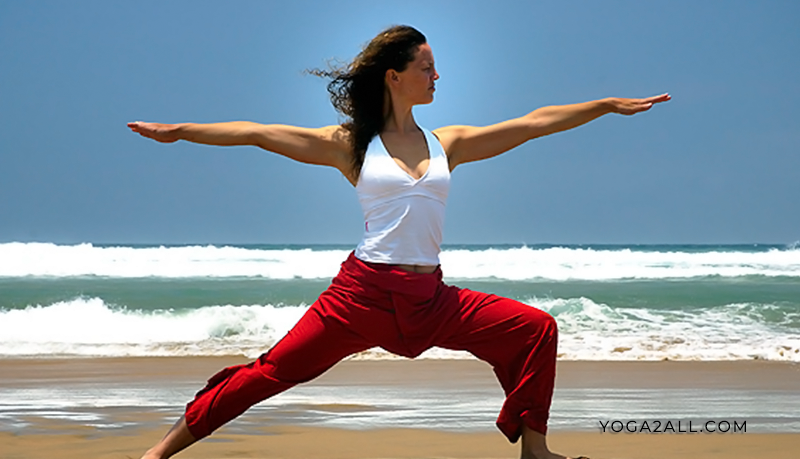 All the time hold the yoga posture with the determination of a warrior. Keep breathing as you go down. Feel and Smile like a happy smiling warrior. Breathing in, come up. Breathing out, bring your hands down from the sides. Now repeat the yoga posture for the left side. Strengthens and tones your arms, legs and lower back. 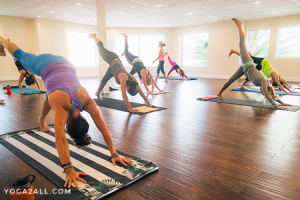 This yoga Improves balance in your body which helps increase stamina. Warrior Pose is beneficial for those with sedentary or deskbound jobs. This yoga pose is extremely beneficial in case of frozen shoulders. Warrior yoga pose releases the stress in the shoulders (if any) very effectively in a short span of time. The most beneficial is that by practicing this pose it brings auspiciousness and courage in you and core awareness. Strengthens your shoulders, arms, thighs, legs and ankles. Stretches your groins, thighs, and ankles. Expands your chest, lungs and shoulders. Stimulates abdominal organs and digestion. Builds core strength in your torso, abdomen, spine and pelvic floor. Quiets your mind, calms your nervous system and reduces anxiety.